We use environmentally friendly car wash products. Try Rain X for rims, windshields & insect repellent. Preserve your rims & ensure clear visibility & safety while out on the road. One coupon per customer. Not valid with any other offer. With Valpak® coupon only. Must present coupon at time of purchase. Coupon void if altered. Expires 05/06/2019. Rain X included. We use environmentally friendly car wash products. Try Rain X for rims, windshields & insect repellent. Preserve your rims & ensure clear visibility & safety while out on the road. One coupon per customer. Not valid with any other offer. With Valpak® coupon only. Must present coupon at time of purchase. Coupon void if altered. Expires 05/06/2019. De Wagen Wasserij is Lynden, WA local auto car wash. Located in the heart of Lynden, Washington, find us on the corner 2nd & Grover just around the corner from Lynden’s famous Dutch Village. Call about our Fleet accounts! De Wagen Wasserij is a locally owned and operated professional car wash that cleans and protects all vehicles. Here we believe each vehicle is the 2nd largest investment of our customer, making the vehicle as well as the customer our #1 focus. Involvement with local youth sports organizations and the variety of fundraisers and promotions add to De Wagen Wasserij’s philosophy of commitment to the community. We, at De Wagen Wasserij also care about our environment not just for ourselves, but for our future generations as well. That’s why not only all the soaps that we use here are 100% earth friendly, we have also upgraded all other aspects of our site to be more energy conscious including our lights, water, and heating systems. Be assured that washing here will not only be a benefit to your vehicle, but to your surrounding community and planet as well. We offer Rain-X and Black Magic products. 100% earth friendly to reduce ground pollution... & energy conscious! Located in the heart of Lynden, Washington, find us on the corner 2nd & Grover just around the corner from Lynden's famous Dutch Village. We offer a full spectrum of services to get your vehicle looking like new. Whether you need a full exterior wash, vacuum, or just an air freshener, we've got you covered!. Six separate vacuums, 1 vacuum that serves as a fragrance machine, 1 vacuum that serves as a shampoo machine to clean interior carpets. This attended automatic wash offers tire cleaners, high quality presoak followed by soft cloth that flicks the dirt away. Additionally, you can upgrade to the options of Rain-X, Rain-X for Rims, triple foam polish and Black Magic tire shine. Every wash includes a full towel dry., Our brushes are made of pure hog's hair so they wont scratch you car and the cleaners we use are all environmentally safe. If you like a wash that cleans well, but won't touch your car, we offer a touchless automatic. This machine offers triple foam polish, high quality presoak and a spot free rinse along with a powerful dryer to leave your car shiny and like new!. Get the deepest shine of any leading tire spray - no one outshines black magic! We apply this shine by hand and because it is put on by an attendant, the product is controlled to avoid applying it on the rim of your wheels. 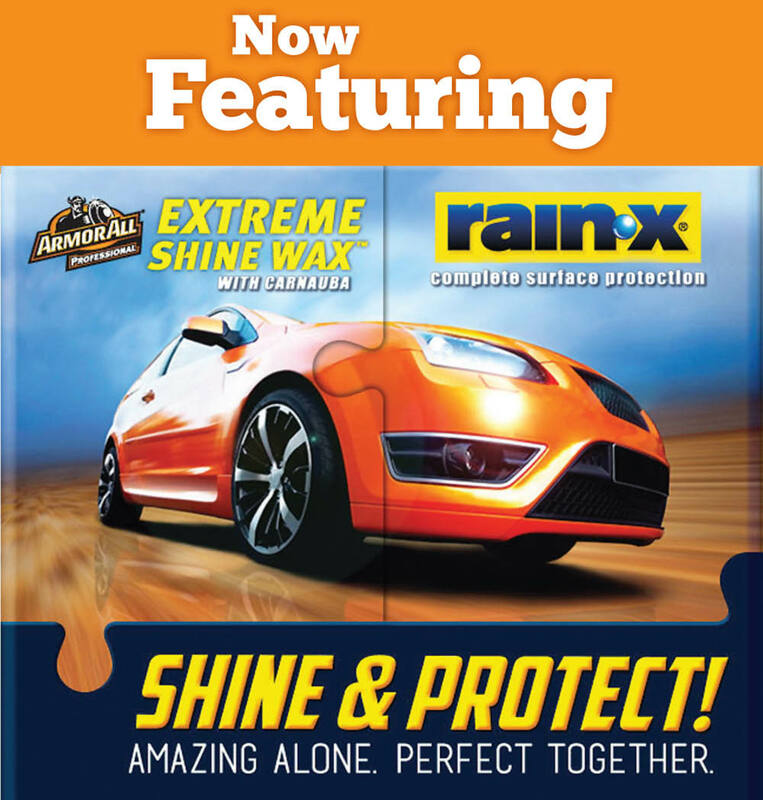 This premium product will give your vehicle increased shine and better surface protection and a water-repellent for safe driving in poor weather., Rain-X is engineered to create a water repellant layer that chemically bonds to all exterior vehicle surfaces - including glass, paint, trim and plastics. A treatment of Rain-X with your wash helps level out the microscopic surface irregularities to enhance shine and water beading as well as longer lasting performance and enhanced protection. Give your rims a shine like never before! Rain-X for Rims works as a protective barrier, guards against brake dust buildup and nasty road grime that can so often destroy your wheels' beautiful finish. Be sure to have Rain-X for Rims applied with your next wash!. Our clean self-serve bays offer a variety of high-end products that allows you to pick and choose what you'd like to apply to your vehicle. Your options include:, Presoak, High pressure soap, High pressure rinse, Spot-free rinse, Tire cleaner, Foaming brush (made of hog's hair), Triple foam polish, Rain-X. Pre-Paid cards are a great way to help keep your vehicle clean! We offer re-loadable cards at our location on Grover Street in Lynden and they can be loaded with any amount you wish from one of our wash attendants., Our cards also make great gifts for friends and family. Plus, anytime you load $50 dollars to your card you receive a FREE Ultimate Tunnel Wash that day! You can also receive special deals when you pay with your card. Make things easy.. Get your pre-paid card today!.